“Ouija” may technically be a trademarked game, but the term is often used to refer to any talking board or spirit board. The boards, marked with all letters of the alphabet, the numbers 0 through 9, and a few simple words, allow users to take turns asking questions from members of the spirit world. 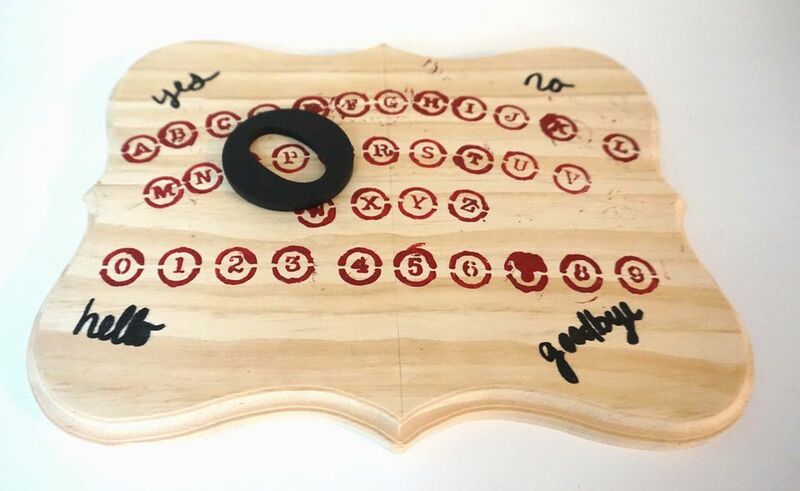 Players all place a finger or two on the planchette—a gliding plastic or wood piece with a viewing hole—and the spirits move it to spell out words or phrases on the ouija board. These boards go way back. Versions of them have even been traced back to ancient China and eventually made its way to America where it became quite popular by the 1800s. An American businessman patented the planchette, which was sold with a ouija board, in 1890. Several studies attest to the ouija board’s accuracy and many say it isn’t so, but there’s only one way to find out if the spirit world connection is real. Make one yourself! For those interested in creating their own unique ouija board, you’re in luck—they’re very simple to make and you just need a few low-cost supplies. You can add your own creativity to the board too, making it uniquely you. Many ouija boards are adorned with images like moons, stars, and suns. Before you begin, it can be helpful to draw guidelines for where you will place the letters and numbers on your ouija board. For this step, use a pencil. That way you can erase it. If you have a straight-edge handy, use that to ensure you have perfectly straight lines. You can also use the edge of your stencil if needed. Draw a vertical line connecting the center points on the top and bottom sides of your wood. Then, draw a horizontal line connecting the center points of the sides. The exact center of your workspace will be right where those two lines intersect. As you are stenciling your letters and numbers, these guidelines will help you determine proper spacing. If you are curving your letters or numbers, you can also draw your curved line guidelines. Choose your favorite color (Tip: using red paint will make your ouija board look even spookier). Use your paint brush to stencil on your letters. You will need to move the stencil after every application, so be careful not to apply the paint too heavily or the stencil will stick. Between every letter and number, gently blow on the paint so it can dry well enough before you move on to the next one. Otherwise, it may smudge. If you feel confident, you could even skip the stencil and draw your letters and numbers by hand. Stenciling is the easiest option for those less artistic folks. Stickers may create a discrepancy in the texture of the board—you want your ouija board to be relatively flat so the spirits can guide the planchette smoothly. Alternately, you can use printable letters and transfer paper. The easiest way to do this is to use a paint pen. This way, you can place your words easily and have better control of how they turn out. If you don’t have a paint pen, you can use any other marker to draw the words yourself, or use acrylic paint and freehand designs. Allow your paint to dry for a couple of hours or, preferably, overnight before using the planchette on its surface. For a planchette, we used a wooden letter “O.” Planchettes must have a viewing hole so you can see what letter, number, or word the spirits want to communicate. Ready to connect with your passed loved ones? This is your tool. You can also use a clear glass like a shot glass or a DIY wood piece if you’re handy. Add felt circles to the bottoms to make your planchette slide easier if needed. Invite over your pals for a spooky night of connecting with the spirit world. Place your fingers on the planchette, ask a question, and let the spirits do the rest.